Disclosed are oral compositions comprising: an effective amount of tea polyphenol; an effective amount of a buffering agent; from about 40 % to about 99 % of one or more aqueous carriers; wherein the oral composition has a total water content of from about 5 % to about 20 %. FIELD The present invention relates to oral compositions comprising tea polyphenol. More specifically, the present invention relates to oral compositions comprising tea polyphenol for providing breath protection and freshness, as well as other oral health benefits. Oral malodor, commonly referred to as bad breath, is generally caused by digestive system problems, oral bacteria, diet, or a combination of any of these factors. Oral bacteria leads to the formation of plaque, which is the origin of dental caries, gingivitis, and dental calculus, as well as bad breath. Dentifrices and other oral care products such as mouthwashes may be useful for combating bad breath. Such products operate to kill the breath odor causing bacteria by chemical means, e.g., anti-microbial agents such as t closan, stannous fluoride, chlorhexidine, quaternary ammonium salts, and camphorated parachlorophenol. However, although such products may improve breath quality immediately after brushing, they do not deliver long lasting benefits. In some cases they may cause undesirable side effects such as staining, altered taste sensation, etc. Tea is a substance that has been planted, e.g., in China, for over one thousand years. Research into the pharmaceutical effects of tea products has previously been done, and some of the active ingredients of tea, e.g., tea polyphenol, caffeine, and lipopolysaccharide, have been introduced into daily chemical products such as medicines, foods, and beverages. However, it is believed that there has been little research focused toward the use of tea in oral care products for consumer use. One previously described use of tea in the oral care field is described in US Patent 5,470,565 to Hayakawa et. al on November 28, 1995, in which a composition for strengthening the acid resistance of teeth comprising at least one tea polyphenol, a fluoride, and an aluminum salt is disclosed. There remains a need for safe, efficacious oral compositions that provide breath freshness with longer-lasting efficacy than conventional products, and which may also deliver other oral health benefits, e.g., caries prevention, anti- oxidation effect, antibiotic effect, dental desensitization effect, free radical scavenging effect, etc. None of the existing art provides all of the advantages and benefits of the present invention. The present invention relates to an oral composition an comprising: an effective amount of tea polyphenol; an effective amount of a buffering agent; from about 40% to about 99% of one or more aqueous carriers; wherein the oral composition has a total water content of from about 5% to about 20%. These and other features, aspects, and advantages of the invention will become evident to those of skill in the art from a reading of the present disclosure. All percentages and ratios used herein are by weight of the oral composition, unless otherwise specified. All measurements referred to herein are made at 25° C, unless otherwise specified. All percentages, ratios, and levels of ingredients referred to herein are based on the actual amount of the ingredient, and do not include solvents, fillers, or other materials with which the ingredient may be combined as a commercially available product, unless otherwise specified. All publications, patent applications, and issued patents mentioned herein are hereby incorporated in their entirety by reference. Citation of any reference is not an admission regarding any determination as to its availability as prior art to the claimed invention. Herein, "comprising" means that other steps and other components which do not affect the end result can be added. This term encompasses the terms "consisting of and "consisting essentially of." Herein, "effective amount" means an amount of a compound or composition sufficient to significantly induce a positive benefit, preferably an oral health benefit, but low enough to avoid serious side effects, i.e., to provide a reasonable benefit to risk ratio, within the sound judgment of a skilled artisan. All ingredients such as actives and other ingredients useful herein may be categorized or described by their cosmetic and/or therapeutic benefit or their postulated mode of action. However, it is to be understood that the actives and other ingredients useful herein can, in some instance, provide more than one cosmetic and/or therapeutic benefit or operate via more than one mode of action. Therefore, classifications herein are made for the sake of convenience and are not intended to limit an ingredient to the particular stated application or applications listed. The oral composition of the present invention may be in the form of a toothpaste or dentifrice. The term "dentifrice", as used herein, means paste, gel, or liquid formulations unless otherwise specified. The dentifrice composition may be in any desired form, such as deep striped, surface striped, multi-layered, having the gel surrounding the paste, or any combination thereof. Alternatively, the oral composition may be one of the dentifrice compositions in a dual phase system comprising two dentifrice compositions contained in a physically separated compartment of a dispenser and dispensed side-by-side. The term "dispenser", as used herein, means any pump, tube, or container suitable for dispensing toothpaste. The term "oral composition" as used herein means the total composition that is delivered to the oral surfaces. The oral composition is a product, which in the ordinary course of usage, is not intentionally swallowed for purposes of systemic administration of particular therapeutic agents, but is rather retained in the oral cavity for a time sufficient to contact substantially all of the dental surfaces and/or oral tissues for purposes of oral activity. The oral compositions of the present invention are of course intended for human use, but they can equally advantageously be used for animals, such as household pets. The term "aqueous carrier" as used herein means any safe and effective materials for use in the compositions of the present invention. Such materials include abrasive polishing materials, peroxide sources, alkali metal bicarbonate sources, anti-tartar agents, thickening materials, humectants, water, surfactants, titanium dioxide, antioxidants, metal ions, zinc phytic acid, coloring agents, flavor systems, xylitol, sweetening agents, herbal agents, anti-microbial agents, and mixtures thereof. The compositions of the present invention include an effective amount of tea polyphenol. Tea polyphenol generally comprises about 20% to about 40% dry weight of tea, and thus is a major component of tea (camellia sinesis L), which is commonly drunk on a daily basis by many people throughout the world. Other components found in tea include lipopolysaccharide, caffeine, alkaloid, inorganic element, amino acid, organic acid, vitamin, protein, and other trace elements. Tea polyphenol is a mixture of the polyphenolic species extracted from tea, the most important components of which are catechines, flaranols, flaraones, chlorogenic acid, phenolic acid, glycosids and their alglycons of plant pigment. Without being bound by theory, it is believed that the catechines are the component of the tea polyphenol that provides the physiologically efficacious effects. The other components of tea polyphenol are believed to improve the efficacy of the catechines, as well as to independently provide efficacious effects such as anti-bacteria effect and acceleration of saliva circulation. It is believed that the catechines are useful for anti-bacterial and breath protection effects. As the major components of malodor, methyl mercaptan and trimethylamine can be cleaned by using 2-5 mg/ml of catechines in about 2-5 minutes. At the same time, catechines can be adhered to the oral cavity for more than one hour. Without being bound by theory, it is also believed that tea polyphenol is potentially useful for anti-caries, anti-gingivitis, anti-stomatitis effect, as well as other oral health benefits. Tea polyphenol is safe for humans. As noted above, it is a natural component of the teas that are regularly consumed by humans. Although it is believed that there is no true upper limit to amount of tea polyphenol that can be incorporated into the compositions of the present invention, it is believed that levels of from about 0.5% to about 2% as an active ingredient are sufficient to deliver its efficacious effects. It is further believed that tea polyphenol can react with sulfhydryl compound and amino compound in neutral condition, so tea polyphenol can remove oral malodor directly. Below is summarized the mechanism believed to be responsible for this effect. The deodorization effect is much higher than sodium copper chlorophyllin (SCC), which is the standard reference component for malodor cleaning. It is also believed that oral bacteria do not thrive, and that tea polyphenol is more stable in acidic environments; therefore, it is believed that compositions having lower pH value buffer systems may provide better breath protection efficacy. Although pH levels of up to about 10 may be used herein, the preferred pH range for compositions of the present invention is from about 4 to about 8, with pH levels of about 5.5 to about 8 being more preferred. It is also believed that lower purity (e.g, 85% purity) tea polyphenol has better efficacy as compared to higher purity (e.g., 95% purity) tea polyphenol. 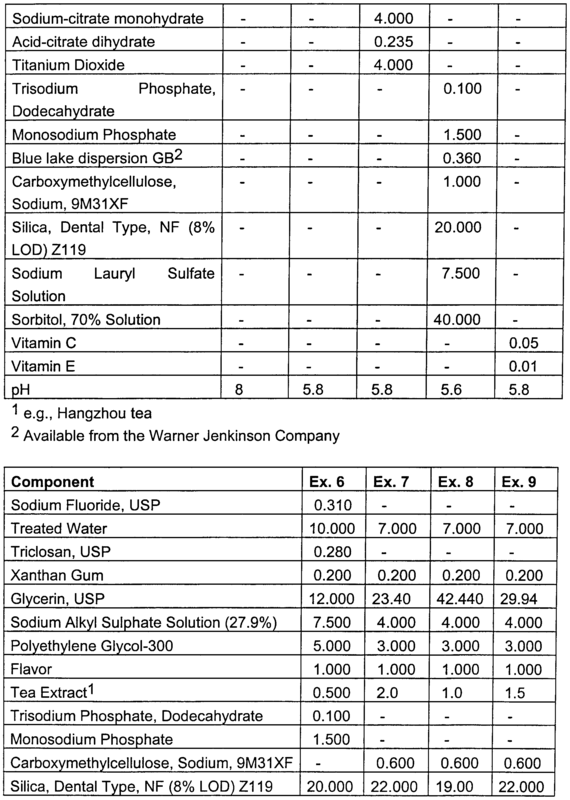 The term "x% purity tea polyphenol" herein refers to a tea that has x% of tea polyphenol present in the tea mixture, the remainder of the tea being comprised of other tea components, e.g., tannic acid, alkaloid, vitamin, polysaccharide, etc. Without being bound by theory, it is believed that the better efficacy of the lower purity (85%) tea polyphenol is due to the vitamin series chemicals, tannic acid, chlorogenic acid and alkaloid (such as caffeine), etc. that are present in the lower purity tea polyphenol. AH of these chemicals can inhabit the growth of oral bacteria and improve the activity of oral enzyme, such as saliva amylase. This effect is demonstrated in Example 12 herein, and in Fig. 3. In addition to breath protection efficacy, it is further believed that tea polyphenol can provide other oral health benefits, such as anti-caries effect, anitbiotic effect, dental desensitization effect, and free radical scavenging/cholesterol cleansing effect. Anti-caries effect may be due to the fact that the fluoride level in tea is high enough to prevent calcium loss from teeth, and also because tea polyphenol inhibits the growth and adhesion of germs (e.g., Streptococcus mutans and S. sobrinud) on the tooth surface. In addition, tea polyphenol can inhibit the activity of transglucosylase to reduce the level of dextran which would help germs adhere on the tooth surface. Tea polyphenol can also reduce the ptyalase activity to interrupt carbohydrate degradation from starch to glucose in the mouth. It is believed that lower pH systems, e.g., pH levels of from about 4 to about 6, provide better anti-caries effect that higher pH systems. Antibiotic effect, as noted in Table 1 above, may be due to the microbe killing power of tea polyphenol as well as its ability to enhance the growth of beneficial microbes (e.g., Bifidobacillus). Reduction of such harmful microbes can provide protection against caries, gingivitis, periodontosis, dental calculus, as well as breath protection. (K4P2O7) in their unhydrated as well as hydrated forms are the preferred species. In compositions of the present invention, the pyrophosphate salt may be present in one of three ways: predominately dissolved, predominately undissolved, or a mixture of dissolved and undissolved pyrophosphate. Compositions comprising predominately dissolved pyrophosphate refer to compositions where at least one pyrophosphate ion source is in an amount sufficient to provide at least about 1.0% free pyrophosphate ions. The amount of free pyrophosphate ions may be from about 1 % to about 15%, preferably from about 1.5% to about 10%, and most preferably from about 2% to about 6%, by weight of the composition. Free pyrophosphate ions may be present in a variety of protonated states depending on a the pH of the composition. Compositions comprising predominately undissolved pyrophosphate refer to compositions containing no more than about 20% of the total pyrophosphate salt dissolved in the composition, preferably less than about 10% of the total pyrophosphate dissolved in the composition. Tetrasodium pyrophosphate salt and tetrapotassium pyrophosphate salt are the preferred pyrophosphate salts in these compositions, with tetrasodium pyrophosphate salt being the more preferred. Tetrasodium pyrophosphate may be the anhydrous salt form or the decahydrate form, or any other species stable in solid form in the dentifrice compositions. The salt is in its solid particle form, which may be its crystalline and/or amorphous state, with the particle size of the salt preferably being small enough to be aesthetically acceptable and readily soluble during use. The amount of pyrophosphate salt useful in making these compositions is any tartar control effective amount, and is generally from about 1.5% to about 15%, preferably from about 2% to about 10%, and most preferably from about 2.5% to about 8%, by weight of the composition. Some or all of the tetrasodium pyrophosphate maybe undissolved in the product and present as tetrasodium pyrophosphate particles. Pyrophosphate ions in different protonated states (e.g., HP2O7-3) may also exist depending upon the pH of the composition and if part of the tetrasodium pyrophosphate is dissolved. The pyrophosphate salts are described in more detail in Kirk & Othmer, Encyclopedia of Chemical Technology, Third Edition, Volume 17, Wiley- Interscience Publishers (1982). Anti-tartar agents known for use in dental care products include phosphates. Phosphates include pyrophosphates, polyphosphates, polyphosphonates and mixtures thereof. Pyrophosphates are among the best known for use in dental care products. Pyrophosphate and polyphosphate ions are delivered to the teeth derive from pyrophosphate polyphosphate salts. The pyrophosphate salts useful in the present compositions include the dialkali metal pyrophosphate salts, tetra-alkali metal pyrophosphate salts, and mixtures thereof. Sodium acid pyrophsophate, disodium dihydrogen pyrophosphate (Na2H2P2θ7), tetrasodium pyrophosphate (Na4P2θ7), and tetrapotassium pyrophosphate (K4P2O7) in their unhydrated as well as hydrated forms are the preferred species. While any of the above mentioned pyrophosphate salts may be used, tetrasodium pyrophosphate salt is preferred. Sodium polyphosphate and triethanolamine polyphosphates, for example, are preferred. Interscience Publishers (1982). Additional anticalculus agents include pyrophosphates or polyphosphates disclosed in U.S. Patent No. 4,590,066 issued to Parran & Sakkab on May 20, 1986; polyacrylates and other polycarboxylates such as those disclosed in U.S. Patent No. 3,429,963 issued to Shedlovsky on February 25, 1969 and U.S. Patent No. 4,304,766 issued to Chang on December 8, 1981 ; and U.S. Patent No. 4,661 ,341 issued to Benedict & Sunberg on April 28, 1987; polyepoxysuccinates such as those disclosed in U.S. Patent No. 4,846,650 issued to Benedict, Bush & Sunberg on July 11 , 1989; ethylenediaminetetraacetic acid as disclosed in British Patent No. 490,384 dated February 15, 1937; nitrilotriacetic acid and related compounds as disclosed in U.S. Patent No. 3,678,154 issued to Widder & Briner on July 18, 1972; polyphosphonates as disclosed in U.S. Patent No. 3,737,533 issued to Francis on June 5, 1973, U.S. Patent No. 3,988,443 issued to Ploger, Schmidt- Dunker & Gloxhuber on October 26, 1976 and U.S. Patent No. 4,877,603 issued to Degenhardt & Kozikowski on October 31 , 1989. Anticalculus phosphates include potassium and sodium pyrophosphates; sodium tripolyphosphate; diphosphonates, such as ethane-1-hydroxy-1 ,1-diphosphonate, 1- azacycloheptane-1 ,1-diphosphonate, and linear alkyl diphosphonates; linear carboxylic acids; and sodium zinc citrate. The present invention compositions in the form of toothpastes, typically contain some thickening material or binders to provide a desirable consistency. Preferred thickening agents are carboxyvinyl polymers, carrageenan, hydroxyethyl cellulose, and water soluble salts of cellulose ethers such as sodium carboxymethylcellulose and sodium hydroxyethyl cellulose. Natural gums such as gum karaya, xanthan gum, gum arabic, and gum tragacanth can also be used. Colloidal magnesium aluminum silicate or finely divided silica can be used as part of the thickening agent to further improve texture. Thickening agents can be used in an of amount from about 0.1 % to about 15%, by weight of the dentifrice composition. Another optional component of the compositions desired herein is a humectant. The humectant serves to keep toothpaste compositions from hardening upon exposure to air and certain humectants can also impart desirable sweetness of flavor to toothpaste compositions. Suitable humectants for use in the invention include glycerin, sorbitol, polyethylene glycol, propylene glycol, and other edible polyhydric alcohols. The humectant generally comprises from about 0% to 70%, and preferably from about 15% to 55%, by weight of the composition. The present compositions may also comprise surfactants, also commonly referred to as sudsing agents. Suitable surfactants are those which are reasonably stable and foam throughout a wide pH range. The surfactant may be anionic, nonionic, amphoteric, zwitterionic, cationic, or mixtures thereof. Anionic surfactants useful herein include the water-soluble salts of alkyl sulfates having from 8 to 20 carbon atoms in the alkyl radical (e.g., sodium alkyl sulfate) and the water-soluble salts of sulfonated monoglycerides of fatty acids having from 8 to 20 carbon atoms. Sodium lauryl sulfate and sodium coconut monoglyceride sulfonates are examples of anionic surfactants of this type. Other suitable anionic surfactants are sarcosinates, such as sodium lauroyl sarcosinate, taurates, sodium lauryl sulfoacetate, sodium lauroyl isethionate, sodium laureth carboxylate, and sodium dodecyl benzenesulfonate. Mixtures of anionic surfactants can also be employed. Many suitable anionic surfactants are disclosed by Agricola et al., U.S. Patent 3,959,458, issued May 25, 1976. Nonionic surfactants which can be used in the compositions of the present invention can be broadly defined as compounds produced by the condensation of alkylene oxide groups (hydrophilic in nature) with an organic hydrophobic compound which may be aliphatic or alkyl-aromatic in nature. Examples of suitable nonionic surfactants include poloxamers (sold under trade name Pluronic), polyoxyethylene, polyoxyethylene sorbitan esters (sold under trade name Tweens), fatty alcohol ethoxylates, polyethylene oxide condensates of alkyl phenols, products derived from the condensation of ethylene oxide with the reaction product of propylene oxide and ethylene diamine, ethylene oxide condensates of aliphatic alcohols, long chain tertiary amine oxides, long chain tertiary phosphine oxides, long chain dialkyl sulfoxides, and mixtures of such materials. The amphoteric surfactants useful in the present invention can be broadly described as derivatives of aliphatic secondary and tertiary amines in which the aliphatic radical can be a straight chain or branched and wherein one of the aliphatic substituents contains from about 8 to about 18 carbon atoms and one contains an anionic water-solubilizing group, e.g., carboxylate, sulfonate, sulfate, phosphate, or phosphonate. Other suitable amphoteric surfactants are betaines, specifically cocamidopropyl betaine. Mixtures of amphoteric surfactants can also be employed. Many of these suitable nonionic and amphoteric surfactants are disclosed by Gieske et al., U.S. Patent 4,051 ,234, issued September 27, 1977. The present composition typically comprises one or more surfactants each at a level of from about 0.25% to about 12%, preferably from about 0.5% to about 8%, and most preferably from about 1 % to about 6%, by weight of the composition. Titanium dioxide may also be added to the present composition. Titanium dioxide is a white powder which adds opacity to the compositions. Titanium dioxide generally comprises from about 0.25% to about 5%, by weight of the composition. Antioxidants are generally recognized as useful in compositions such as those of the present invention and may be included herein. Antioxidants are disclosed in texts such as Cadenas and Packer, The Handbook of Antioxidants. © 1996 by Marcel Dekker, Inc. Antioxidants that may be included in the oral care composition or substance of the present invention include, but are not limited to Vitamin E, ascorbic acid (vitamin C), Uric acid, carotenoids, Vitamin A, flavonoids, herbal antioxidants, melatonin, aminoindoles, lipoic acids and mixtures thereof. Vitamins E and C are preferred, with levels of from about 0.01 % to about 0.10% being desirable, and about 0.01 % to about 0.05% being preferred. Herein, vitamins E and C are believed to protect tea polyphenol from oxidizing, and may further enhance tea polyphenol's breath protection effect. Other metal ions may further be added to enhance the breath protection efficacy of tea polyphenol. Such ions include but are not limited to, zinc ions, stannous, and copper ions, such as Zn2+, Sn+, and Cu+. Because living cells and proteins have hydroxy, amino and carboxy groups on their surfaces, it is believed that such metal ions could tightly link tea polyphenol with S. Mutan and other bacteria, to enhance the reduction in volatile sulfur compounds that contribute to oral malodor. Zinc phytic acid is another agent that is believed to be able to enhance tea polyphenol's breath protection efficacy and increase the stability of tea polyphenol. It may also independently provide breath protection, anti-plaque, and anti-bacteria efficacy. Coloring agents may also be added to the present composition. The coloring agent may be in the form of an aqueous solution, preferably 1 % coloring agent in a solution of water. Color solutions generally comprise from about 0.01 % to about 5%, by weight of the composition. A flavor system can also be added to the compositions. Suitable flavoring components include tea mint, oil of wintergreen, oil of peppermint, oil of spearmint, clove bud oil, menthol, anethole, methyl salicylate, eucalyptol, cassia, 1-menthyl acetate, sage, eugenol, parsley oil, oxanone, alpha-irisone, marjoram, lemon, orange, propenyl guaethol, cinnamon, vanillin, ethyl vanillin, heliotropine, 4-cis-heptenal, diacetyl, methyl-para-tert-butyl phenyl acetate, and mixtures thereof. Coolants may also be part of the flavor system. Preferred coolants in the present compositions are the paramenthan carboxyamide agents such as N- ethyl-p-menthan-3-carboxamide (known commercially as "WS-3") and mixtures thereof. A flavor system is generally used in the compositions at levels of from about 0.001 % to about 5%, by weight of the composition. The present invention may also include xylitol. Xylitol is a sugar alcohol that is used as a sweetener and humectant. Xylitol may provide a therapeutic effect, such as an antibacterial or anticaries effect. The present compositions typically comprise xylitol at a level from about 0.01 % to about 25%, preferably from about 3% to about 15%, more preferably from about 5% to about 12%, and most preferably from about 9% to about 11 %, by weight of the total composition. Alternatively, if xylitol is used as a sweetener, it may be present at a lower level, such as from about 0.005% to about 5%, by weight of the dentifrice composition. Sweetening agents can be added to the compositions. These include saccharin, dextrose, sucrose, lactose, maltose, levulose, aspartame, sodium cyclamate, D-tryptophan, dihydrochalcones, acesulfame, and mixtures thereof. Various coloring agents may also be incorporated in the present invention. Sweetening agents and coloring agents are generally used in toothpastes at levels of from about 0.005% to about 5%, by weight of the composition. 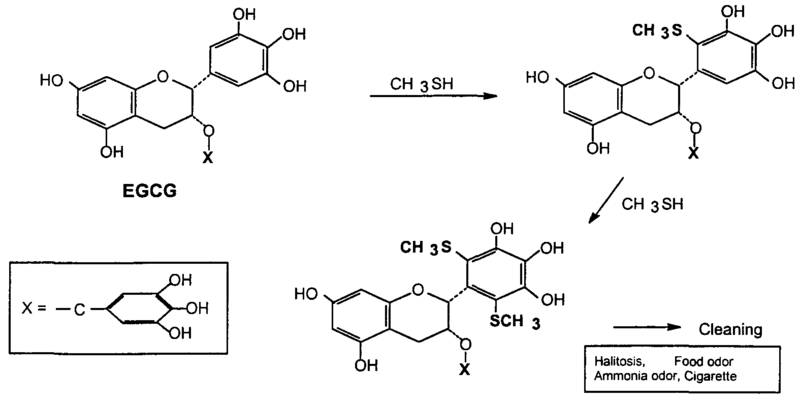 Herbal agents, including but not limited to, golden thread extract and honeysuckle extract, may also be present in the compositions herein at levels of from about 0.01 % to about 0.05%. Such herbal agents are believed to provide anti-bacteria efficacy. Other anti-microbial agents can also be present in the oral care compositions or substances of the present invention. A preferable agent is 5- chloro-2-(2,4-dichlorophenoxy)-phenol, commonly referred to as triclosan, and described in The Merck Index. 11th ed. (1989), pp. 1529 (entry no. 9573) in U.S. Patent No. 3,506,720, and in European Patent Application No. 0,251 ,591 of Beecham Group, PLC, published January 7, 1988. Without being bound by theory, it is believed that the combination of triclosan and tea polyphenol may provides even better breath protection effect than tea polyphenol alone. Other specific antimicrobial agents include chlorhexidine, triclosan monophosphate, and essential oils including thymol, geraniol, carvacrol, citral, hinokitiol, eucalyptol, and mixtures thereof. Triclosan and other agents of this type are disclosed in Parran, Jr. et al., U.S. Patent 5,015,466, issued May 14, 1991 , and U.S. Patent 4,894,220, Jan. 16, 1990 to Nabi et al. These agents may be present at levels of from about 0.01 % to about 1.5%, by weight of the composition. Also included among such other anti-microbial agents are water insoluble non-cationic antimicrobial agents such as halogenated diphenyl ethers, phenolic compounds including phenol and its homologs, mono and poly-alkyl and aromatic halophenols, resorcinol and its derivatives, bisphenolic compounds and halogenated salicylanilides, benzoic esters, and halogenated carbanilides. The water soluble antimicrobials include quaternary ammonium salts and bis- biquanide salts, among others. Triclosan monophosphate is also a suitable water soluble antimicrobial agent. The quaternary ammonium agents include those in which one or two of the substitutes on the quaternary nitrogen has a carbon chain length (typically alkyl group) from about 8 to about 20, typically from about 10 to about 18 carbon atoms while the remaining substitutes (typically alkyl or benzyl group) have a lower number of carbon atoms, such as from about 1 to about 7 carbon atoms, typically methyl or ethyl groups. Dodecyl trimethyl ammonium bromide, tetradecylpyridinium chloride, domiphen bromide, N- tetradecyl-4-ethyl pyridinium chloride, dodecyl dimethyl (2-phenoxyethyl) ammonium bromide, benzyl dimethylstearyl ammonium chloride, cetyl pyridinium chloride, quatemized 5-amino-1 ,3-bis(2-ethyl-hexyl)-5-methyl hexa hydropyrimidine, benzalkonium chloride, benzethonium chloride and methyl benzethonium chloride are exemplary of typical quaternary ammonium antibacterial agents. Other compounds are bis[4-(R-amino)-1 -pyridinium] alkanes as disclosed in U.S. Patent 4,206,215, issued June 3, 1980, to Bailey. Stannous salts such as stannous pyrophosphate and stannous gluconate and other antimicrobials such as copper bisglycinate, copper glysinate, zinc citrate, and zinc lactate may also be included. Also useful are enzymes, including endoglycosidase, papain, dextranase, mutanase, and mixtures thereof. Such agents are disclosed in U.S. Patent 2,946,725, Jul. 26, 1960, to Norris et al. and in U.S. Patent 4,051 ,234, September. 27, 1977 to Gieske et al., incorporated herein by reference. In order to illustrate the benefits of the preferred embodiments of the present invention, in the following Example 10, breath protection efficacy of seven compositions over four hours is compared with by conducting a Halimeter test according to the following procedure. All test participants test breath level with the Halimeter in the morning before brushing the teeth, drinking, or eating (the 0 hour measurement). After the morning measurement, all participants eat the same food and drink the same beverage for breakfast. After breakfast, all eating and drinking is prohibited. After eating, each participant brushes his or her teeth using the assigned test composition. One hour later, the second Halimeter measurement is taken; two hours later the third measurement is taken; three hours later the fourth measurement is taken; four hours later the fifth measurement is taken. Just prior to each Halimeter measurement, participants are requested not to speak and to hold the lips closed for 30 seconds. The Halimeter detects the presence of volatile sulfur compounds in the breath. The volatile sulfur compounds include hydrogen sulfide, methyl mercaptan, dimethylsulfide, ethylsulfide and dimethyldisulfide, all of which contribute to bad breath. Thus, the higher the Halimeter reading, the less breath protection that is provided. * CREST MANY-IN-ONE and CREST KC are commercially available dentifrice products from the Procter & Gamble Company, Cincinnati Ohio, USA, and Procter & Gamble (China), Ltd. Neither product contains tea polyphenol. The foregoing Example is graphically represented as Fig. 1 , in which the square-shaped data points represent the composition comprising 2% Tea Polyphenol with Triclosan, pH=8; the diamond-shaped data points represent the composition comprising 0.5% Tea Polyphenol without Triclosan, pH=6; the triangular-shaped data points represent the composition comprising 0.5% Tea Polyphenol with Triclosan, pH=8; the x-shaped data points represent the composition comprising 0.2% Tea Polyphenol with Triclosan, pH=6; the star- shaped data points represent the composition comprising 0.2% Tea Polyphenol with Triclosan, pH=8; the circle-shaped data points represent the commercially- available CREST MANY-IN-ONE composition; and the rectangular-shaped data points represent the commercially-available CREST KC composition. The foregoing example illustrates that a composition comprising tea polyphenol provides better breath protection efficacy over an extended time period (e.g., at least one hour and preferably longer, e.g., at least four hours) as compared to currently marketed formulations that do not contain tea polyphenol. 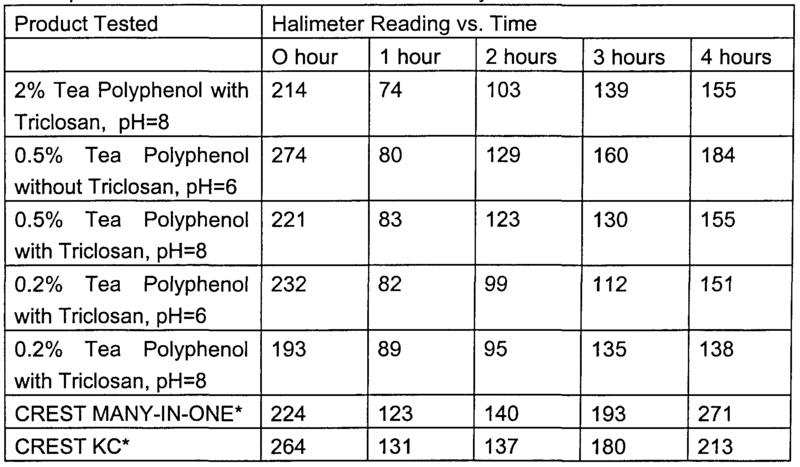 Although all of the test compositions provide some breath protection just after initial use, the Halimeter readings for the non-tea polyphenol containing compositions increase over time as compared to all tea-polyphenol containing compositions, indicating that that breath malodor worsens over time. In addition, the foregoing example illustrates that combining tea polyphenol with an anti-microbial such as triclosan may provide better breath protection benefits than tea polyphenol alone. The foregoing Example is graphically represented as Fig. 2, in which the the diamond-shaped data points represent the composition comprising Citric Acid Sodium Citrate plus tea polyphenol, pH=5.8; the triangular-shaped data points represent the composition comprising Citric Acid Sodium Citrate plus Tea Polyphenol, pH=6.5; the square-shaped data points represent the composition comprising Citric Acid Sodium Citrate, pH=5.8; and the x-shaped data points represent the composition comprising Citric Acid Sodium Citrate, pH=6.5. The foregoing example illustrates that a buffered composition comprising tea polyphenol provides breath protection efficacy, whereas the same buffered composition that does not comprise tea polyphenol provides almost no breath protection efficacy. The foregoing Example is graphically represented as Fig. 3, in which the diamond-shaped data points represent the composition comprising 0.5% Tea Polyphenol (85%), pH 6; the square-shaped data points represent the composition comprising 0.2% Tea Polyphenol (85%), pH=6; the triangular- shaped data points represent the composition comprising 0.5% Tea Polyphenol (95%), pH=6; and the x-shaped data points represent the composition comprising 0.2% Tea Polyphenol (95%), pH=6. The VSC (ppb) values are a measure of the volatile sulfur compounds present in the composition. "Ppb" refers to the level of VSC equal to μg/ml. The foregoing example illustrates that the compositions comprising tea polyphenol of the relatively lower purity tend to provide better breath protection than the compositions comprising tea polyphenol of the relatively higher purity. 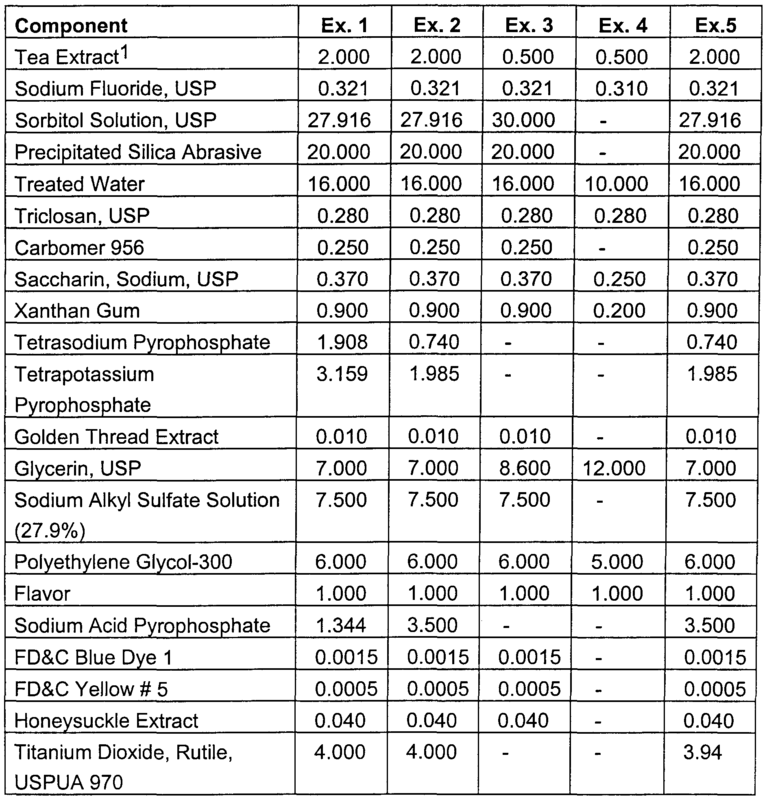 The dentifrice compositions are prepared as follows. Add the water, tea extract, and saccharin to a mixing vessel. Dissolve the tea extract, and the saccharin in the water. Disperse the thickening agents in the glycerin. Add this mixture of dispersed thickening agents in glycerin to the mixing vessel, mix well, and heat to at least 40° C. Mix the flavor in the surfactant and add to the mixture. Add the polyethylene glycol, propylene glycol, and sodium carbonate (if used). Mix well. Next, add the titanium dioxide and the silica. After mixing, add the sodium bicarbonate (if used) and sodium alkyl sulfate. Finally, add the polyphosphate and calcium peroxide (if used). Continue stirring the mixture until homogeneous. It is understood that the examples and embodiments described herein are for illustrative purposes only and that various modifications or changes in light thereof will be suggested to one skilled in the art without departing from the scope of the present invention. 2. The composition of Claim 1 further comprising from about 0.15% to about 2.5% of a fluoride ion source. 3. The oral composition according to Claim 1 comprising from about 0.5% to about 2% of tea polyphenol. 4. The oral composition according to Claim 1 wherein the buffering agent is selected from the group consisting of pyrophospate salts, citric acid, sodium citrate, and mixtures thereof. 5. The oral composition of Claim 1 wherein the aqueous carriers are materials selected from the group consisting of abrasive polishing materials, peroxide sources, alkali metal bicarbonate sources, anti-tartar agents, thickening materials, humectants, water, surfactants, titanium dioxide, antioxidants, metal ions, zinc phytic acid, coloring agents, flavor systems, xylitol, sweetening agents, herbal agents, anti-microbial agents, and mixtures thereof. 6. The oral composition according to Claim 5 wherein the anti-microbial agent is triclosan. 7. The oral composition according to Claim 6 wherein the abrasive polishing material is selected from the group consisting of silicas, aluminas, phosphates, orthophosphates, polymetaphosphates, and mixtures thereof. 8. The oral composition according to Claim 1 wherein the composition has a pH of from about 4 to about 8. 9. The composition of claim 1 wherein the level of volatile sulfur compounds present in the oral cavity is reduced for at least one hour after the oral cavity is contacted with the oral composition, as measured by Halimeter test. 10. A method for freshening the breath of a human or an animal comprising contacting the oral cavity surfaces with the oral composition according to Claim 1. KR101056960B1 (en) 2008-11-25 2011-08-16 주식회사 휴비츠 Corneal curvature measuring method for compensating for the position error measured and geomangi using the same. ES2252992T3 (en) 2006-05-16 Methods of reducing astringency of stannous compounds into dentifrice compositions.